Zebrafish have been increasingly used for monitoring and assessing the effects of different contaminants in the aquatic environments. In the present study, zebrafish embryos and larvae were used to study the effects of the insecticide diazinon and the herbicide diuron in regard to occurrence of oxidative stress-related cellular responses, multixenobiotic resistance (MXR)-related efflux transporter activity—which represents the first line of defense against xenobiotics in many aquatic organisms—and responses of different molecular and biochemical biomarkers. The recently established non-invasive quantitative plate assay, which uses the fluorescent probes CM-H2DCFDA and CellTracker™ Green CMFDA and measures the fluorescence in whole zebrafish larvae, was applied to assess changes in reactive oxidative species (ROS) and glutathione (GSH) after exposure to the investigated pesticides. The results showed a significant increase of GSH after 1 h exposure of zebrafish larvae to both diazinon and diuron. Regarding the ROS induction, no significant increases in fluorescence could be detected after 2 h exposure to the investigated pesticides. Applying a newly adapted assay for MXR activity, it was determined that diuron caused no change after a 24-h exposure, but caused a significant induction of MXR activity after a 48-h exposure (indicated by a decreased amount of accumulated rhodamine B). On the other hand, diazinon caused an inhibition of MXR activity after both 24 h and 48 h exposure (indicated by an increased amount of accumulated rhodamine B). Regarding the biomarkers, different set-ups and exposure periods were applied and both molecular (gene expression) and biochemical (enzymatic activities) responses were assessed. Diazinon caused an inhibition of carboxylesterase (CES) and acetylcholinesterase (AChE) activity in zebrafish larvae, diuron inhibited AChE activity in in vitro testing, and both pesticides significantly affected gene expression and activities of some of the cytochrome P450 (CYP) family enzymes. The obtained results show various effects of the investigated pesticides and will help to elucidate how aquatic animals cope with pesticides present in their environment. Additionally, the recently developed fluorescence-based assay and the newly adapted MXR activity assay proved to be useful tools for ecotoxicological risk assessment to further investigate pesticide effects. The zebrafish (Danio rerio) is a widely studied model organism for aquatic (eco)toxicology that can be used for the assessments of effects on various levels of biological organization. Especially the fish embryo toxicity test with zebrafish has been proven to be a useful alternative to the common fish toxicity test . The fish embryo toxicity test  can be seen as a refinement or, to some extent, even replacement of animal experiments according to the 3R principle (refinement, reduction, replacement)  as the embryos are assumed to experience less or no pain at all compared to adult fish. Lately, more applications have been developed to further investigate toxicity mechanisms and different endpoints regarding the toxicity of xenobiotics on zebrafish larvae. Hence, they have become an important tool in assessing the modes of action and effects of various xenobiotics [4, 5]. Not only have they been used for the assessment of toxicant effects on embryonic development , but they have also been utilized to analyze changes in behavior (e.g., [7–10]), altered enzyme activities [4, 11], as well as changes on a gene expression level [5, 11–14] and oxidative stress induction , providing valuable data for the risk assessment of xenobiotics and their potential adverse effects on the aquatic environment. Xenobiotics can be found in various environmental compartments and pesticides are one of the main groups which are present in the environment, especially in rivers in agricultural areas. In order to understand their environmental impact better, it is necessary to investigate different modes of action to identify any potential effects on the environment . Namely, even though main modes of action by which pesticides impact target organisms are known, pesticides can have many additional effects and might also adversely affect non-target organisms. Because of the risk they pose to ecosystems and non-target organisms it is important to conduct an in-depth analysis of their effects, which is why in the present study two commonly used pesticides were selected for a comprehensive toxicity assessment—the organophosphate insecticide diazinon and the phenylurea herbicide diuron. Diuron is an inhibitor of photosystem II and although the effects on animal organisms would not be expected, it has been previously established that in zebrafish diuron affects behavior and the changes were more pronounced for diuron compared to diazinon . In zebrafish both diazinon and diuron affect gene expression , and diazinon also causes morphological and physiological effects, inhibits AChE activity and increases the abundance of stress protein (Hsp70) [4, 6, 17–19]. As the modes of action of pesticides are diverse, it is possible that these pesticides cause even more effects, which can reveal the specific actions and enable better characterization of their impacts on zebrafish as a model species for aquatic vertebrates. Additional effects could also contribute to the toxicity of pesticides and such information is crucial for prediction of the overall effects of pesticides in the environment. Oxidative stress is caused by environmental factors or stressors which lead to the imbalance of ROS molecules and antioxidants (e.g., low molecular weight antioxidant GSH) in favor of prooxidants (reviewed in ) and it plays an important role in the toxicity of various pesticides, since the exposure to pesticides can lead to an increased production of free radicals that further accumulate in the cell, cause alterations in antioxidant defense mechanisms, including detoxification and scavenging enzymes, and induce lipid peroxidation as a result of the interaction between reactive oxygen species (ROS) and cellular or subcellular membranes . The occurrence of oxidative stress can be monitored using fluorescent probes which react with ROS with a certain degree of specificity modifying their chemical structure so they emit fluorescence. In the present study, a recently developed non-invasive quantitative plate assay using the fluorescent probes CM-H2DCFDA and CellTracker™ Green CMFDA  has been applied to measure the fluorescence in whole zebrafish larvae and investigate the effects of diazinon and diuron. The usage of whole zebrafish larvae for measurements eliminates the need for pooling of larvae for each sample, and it thereby reduces the number of samples required for measurement. Consequently the protocol using whole zebrafish larvae was adjusted for the detection of multixenobiotic resistance (MXR) activity. MXR is an important mechanism of cellular efflux mediated by ATP binding cassette (ABC) transporters with MXR efflux proteins being involved in the elimination of xenobiotics from cells (e.g., [22–24]). The molecular mechanism of the MXR, which involves a transmembrane P-glycoprotein that binds the xenobiotics, is known as an important first line of defense for most organisms and has been shown to exist in various aquatic organisms . Xenobiotics with a high affinity for P-glycoprotein may inhibit efflux of low levels of toxic compounds which normally would not adversely affect the cell . Since it has been previously reported that some pesticides can influence the MXR activity, including diazinon affecting MXR activity in Dreissena polymorpha  and diuron affecting MXR activity in Oreochromis niloticus , this study determined whether diazinon and diuron affect the MXR activity in zebrafish and therefore disturb the defense mechanism of the cells. Finally, the responses of zebrafish larvae exposed to diazinon and diuron were assessed by means of already established molecular and biochemical biomarkers. The evaluation of biochemical alterations can be used for an early detection of environmental contamination. Biotransformation enzymes, which include cytochrome P450 enzymes (CYP) and glutathione S-transferase (GST), are relevant parameters for evaluation of toxicity since they may condition the final outcome (i.e. toxicity vs. inactivation) of a vast array of xenobiotics . Also, as already mentioned, oxidative stress can substantially contribute to the toxicity of xenobiotics. The responses of organisms can be assessed by monitoring changes in their antioxidant defenses such as changes in the activities of superoxide dismutase (SOD), glutathione peroxidase (GPx) or catalase (CAT) (e.g., ). Organophosphates, such as diazinon, are known to inhibit the activity of acetylcholinesterase (AChE) , so this biomarker was also included in the assessment. Hence, the effects of diazinon and diuron were assessed by measuring biotransformation enzymes, oxidative stress biomarkers and AChE activity in vivo, complemented with the measurement of biotransformation enzymes and AChE activity in vitro. Besides the biochemical responses, the effects of diazinon and diuron were also assessed on a molecular level. Namely, experimental studies have shown that toxicant responsive genes, such as cytochrome P450s (cyp) and glutathione S-transferases (gst) play a critical role in pesticide-induced toxicity  and were, therefore, used for the evaluation of diazinon and diuron effects. Considering the previously determined effects of diazinon and diuron on zebrafish, the objective of this work was to assess how these pesticides can impair physiological mechanisms of zebrafish. The present study evaluated the effects of diazinon and diuron on the occurrence of oxidative stress, changes in the MXR activity and several biochemical and molecular biomarkers primarily related to the biotransformation process. The results will further elucidate mechanisms of action of diazinon and diuron and will contribute in explaining how aquatic animals cope with pesticides present in their environment. The following chemicals were used: acetonitrile (CH3CN, CAS Number 75-05-8); acetylthiocholine iodide (CAS Number 6050-81-3); 4-aminobenzoic acid ethyl ester (benzocaine) (CAS Number 94-09-7); bovine serum albumin (CAS Number 9048-46-8), calcium chloride dihydrate (CAS Number 10035-04-8); dimethyl sulfoxide (DMSO) (CAS Number 67-68-5); disodium hydrogen phosphate (CAS Number 7558-79-4); O,O-diethyl O-[4-methyl-6-(propan-2-yl)pyrimidin-2-yl] phosphorothioate (diazinon) (CAS Number 333-41-5), 3-(3,4-dichlorophenyl)-1,1-dimethylurea (diuron) (CAS Number 330-54-1); Dulbecco’s phosphate buffered saline (PBS); ethanol (CAS Number 64-17-5); glutathione reductase (CAS Number 9001-48-3); l-glutathione oxidized disodium salt (GSSG) (CAS Number 103239-24-3); hydrogen peroxide (CAS Number 7722-84-1); magnesium sulfate heptahydrate (CAS Number 10034-99-8); methanol (CAS Number 67-56-1); sodium hydrogen carbonate (CAS Number 144-55-8); potassium chloride (CAS Number 7447-40-7); magnesium chloride (CAS Number 7786-30-3 7791-18-6); sodium phosphate monobasic (CAS 7558-80-7); 4-nitrophenyl acetate (CAS Number 830-03-5); reduced glutathione (GSH) (CAS Number 70-18-8); 7-hydroxy-3H-phenoxazin-3-one (Resorufin) (CAS Number 635-78-9); sodium bicarbonate (CAS Number 144-55-8); sulfosalicylic acid (CAS Number 97-05-2); tert-butyl hydroperoxide (tert-BHP) (CAS Number 75-91-2); β-nicotinamide adenine dinucleotide 2′-phosphate reduced tetrasodium salt hydrate (β-NADPH) [CAS Number 2646-71-1 (anhydrous)]; 1-chloro-2,4-dinitrobenzene (CDNB) (CAS Number 97-00-7); 2-vinylpyridine (CAS Number 100-69-6); 5,5′-dithiobis-(2-nitrobenzoic acid) (DTNB) (CAS Number 69-78-3); 7-ethoxyresorufin (CAS Number 5725-91-7); rhodamine B (RB) (CAS Number 81-88-9); α-naphthoflavone (CAS Number 604-59-1); (±)-1-[2-(2,4-dichlorobenzyloxy)-2-(2,4-dichlorophenyl)ethyl]-1H-imidazole (miconazole, CAS Number 22916-47-8); (±)-cis-1-acetyl-4-(4-[(2-[2,4-dichlorophenyl]-2-[1H-imidazol-1-ylmethyl]-1,3-dioxolan-4-yl)-methoxy)phenyl)piperazine (ketoconazole, CAS Number 65277-42-1); quinidine (CAS Number 56-54-2). 5-Chloromethylfluorescein diacetate (CellTracker™ Green CMFDA) and CM-H2DCFDA were obtained from Molecular Probes (Oregon, USA). Microsomes from baculovirus-infected cells coexpressing human CYP1A2, CYP2A6, CYP2B6, CYP2D6, CYP2C9, CYP2C19 and CYP3A4, together with NADPH-cytochrome P450 reductase (P450 baculosomes) and the NADPH regeneration system containing glucose-6-phosphate and glucose-6-phosphate dehydrogenase were purchased from Life Technologies (Carlsbad, CA, USA). The following Vivid™ Cytochrome P450 Fluorogenic Probe Substrates from Life Technologies were used: 7-ethoxymethoxy-3-cyanocoumarin (EOMCC, CAS Number 277309-36-1), 3-cyanocoumarin (CC, CAS Number 15119-34-3) and 7-benzyloxymethyloxy-3-cyanocoumarin (BOMCC). Amplex Red Acetylcholine/Acetylcholinesterase Assay Kit from Molecular Probes (Oregon, USA) contained the following: N-acetyl-3,7-dihydroxyphenoxazine (Amplex® Red reagent, Cas Number 119171-73-2); horseradish peroxidase (HRP); 2-amino-2-(hydroxymethyl)-1,3-propanediol hydrochloride (Tris–HCl, CAS Number 1185-53-1); choline oxidase from Alcaligenes sp. ; acetylcholine chloride (CAS Number 60-31-1); acetylcholinesterase from electric eel. TRIzol® was from Sigma-Aldrich. Zebrafish (Danio rerio) were held in glass aquaria at 26 ± 1 °C and each tank contained an external filtration system (biological, chemical, and physical filtration), supplemented by an ultraviolet lamp. Zebrafish experiments were performed partly in Germany at the Institute for Environmental Research, RWTH Aachen University, and partly in Spain at AZTI Zebrafish Facility (REGA Number ES489010006105; Derio, Spain). The fish embryos that were used for the experiments in Germany were from a wildtype zebrafish stock maintained at the Fraunhofer IME institute (Aachen) for more than 20 years, with original stocks obtained in 1992 from West Aquarium GmbH (Bad Lauterberg, Germany). The fish embryos used for experiments in Spain were from a wildtype stock that were bred at the AZTI facility more than 10 years ago. Zebrafish maintenance and egg production was according to standard procedures and is described in detail in a previous study . The embryos were selected visually using a binocular microscope and only fertilized and normally developed eggs undergoing division and showing no obvious irregularities during cleavage (e.g., asymmetry, vesicle formation) or injuries of the chorion were selected . Selected fertilized eggs of the same cell stage were placed in embryo medium prepared according to ISO standards (294 mg/L CaCl2·2H2O, 123.3 mg/L MgSO4·7H2O, 63 mg/L NaHCO3, 5.5 mg/L KCl)  at 27 °C and were used in further testing. The use of zebrafish was in accordance with the animal welfare act. Namely, zebrafish embryos and larvae below 120 h post fertilization (hpf) are still feeding on their yolk , and hence are not considered animals, so that no animal test authorization is required according to European legislation (EU Directive, 2010/63/EU); Real Decreto 53/2013 in Spain and TierSchG (Tierschutzgesetz) and the respective regulation TierSchVersV (Tierschutz-Versuchstierverordnung) in Germany. All experiments were terminated at 120 hpf and the larvae were immediately euthanized by prolonged immersion in a solution of benzocaine in ethanol. The used term “larvae” refers to hatched embryos up to 120 hpf that do not feed externally yet and are still using up the yolk-sac reserves. Oxidative stress was assessed in whole zebrafish larvae (zebrafish embryos were incubated in embryo medium until 96 hpf and the medium was renewed every 24 h) using the fluorescent probes CellTracker™ Green CMFDA and CM-H2DCFDA. The stock solutions of both fluorescent probes were prepared in DMSO, stored at − 20  °C and protected from light, with the working solutions being prepared freshly during the experiment. Diazinon and diuron were dissolved in DMSO (final concentration was 0.1%), and the following concentrations for both pesticides were tested: 1, 2, 5 and 10 mg/L (equaling 3.3, 6.6, 16.5 and 33 µM diazinon and 4.3, 8.6, 21.5 and 43 µM diuron). In order to detect the early effects of pesticides, exposures were conducted for 1 or 2 h (depending on the probe) and the assays were performed according to Lackmann et al. . Even though the tested concentrations were relatively high, the exposure period was short, so they did not cause mortality at the end of the exposure. The standard pro-oxidant tert-butyl hydroperoxide (tert-BHP) was used as a positive control. Since the pesticides and probes were dissolved in DMSO, a solvent control (0.1% DMSO) was tested as well. Experiments were repeated six times and repetitions were conducted as independent experiments (for every repetition zebrafish embryos from different batches were used and solutions were freshly prepared). For the GSH probe (CellTracker™ Green CMFDA) 30 hatched larvae (96 hpf) were exposed to pesticides for 1 h and for the positive control 30 hatched larvae were exposed to 1.5 mM tert-BHP solution prepared in embryo medium for 1 h. Exposures were performed in the absence of light. After 1 h of exposure, larvae were washed twice with embryo medium and incubated with 5 nM CellTracker™ Green CMFDA for 40 min. Larvae were then washed twice with embryo medium, anesthetized using 200 mg/L benzocaine (dissolved in water) and transferred to conical 96-well microplates (one larva per well). For the ROS probe (CM-H2DCFDA) 30 hatched larvae (96 hpf) were first incubated with 1.73 mM CM-H2DCFDA for 2 h and afterwards exposed to pesticides for 2 h. For the positive control 30 hatched larvae were exposed to 1 mM tert-BHP solution prepared in embryo medium for 2 h. The exposure period for this probe was prolonged to 2 h since it was observed that it takes longer for the positive control to induce significant changes . Exposures were performed in the absence of light. After 2 h of exposure, larvae were washed twice with embryo medium, anesthetized using 200 mg/L benzocaine (dissolved in water) and transferred to conical 96-well microplates (one larva per well). The fluorescence in zebrafish larvae was measured using a Tecan M200 reader. The settings of the multi-well plate reader were according to Lackmann et al. with excitation wavelength of 470 nm and emission wavelength of 525 nm. Protocols for measuring MXR activity have been already established (e.g., [35, 36]) and they include exposure of zebrafish embryos to toxicants followed by exposure to fluorescent substrates such as rhodamine B. Embryos are then washed, pooled (e.g., 10 per sample), homogenized and centrifuged, and the fluorescence is measured in the obtained supernatant. In the present study an adapted assay was applied in which the fluorescence is measured in whole zebrafish embryos avoiding the pooling, homogenization and centrifugation. This simplified method allows the measurement of fluorescence in each zebrafish embryo, and thus reduces the total number of zebrafish embryos required for the experiment. This is in accordance with the 3R principle of animal research (replacement, reduction and refinement) . The activity of MXR was measured applying an accumulation assay which is based on the measurement of the level of accumulation of a model P-glycoprotein substrate, the fluorescent dye rhodamine B (RB), in zebrafish embryos. Higher level of MXR activity results in a lower accumulation of RB . After visually selecting the fertilized and normally developed eggs (~ 2 hpf) they were exposed for 24 and 48 h to 1 and 2 mg/L diazinon and diuron (equaling 3.3 and 6.6 µM diazinon and 4.3 and 8.6 µM diuron). Since determined 96 h-NOEC for both pesticides is 2 mg/L , the tested concentrations were sublethal and did not cause any visible effects. In the control group embryos were incubated in embryo medium only and since the pesticides were dissolved in DMSO (final concentration was 0.1%), a solvent control (0.1% DMSO) was also prepared. Additionally, a positive control was tested, where embryos were exposed to the pharmacological inhibitor of P-glycoproteins—cyclosporine A (CYC, 10 μM). After 24 and 48 h of exposure, zebrafish embryos were incubated in the presence of the fluorescent dye—rhodamine B (RB)—for 90 min in the dark to prevent photo degradation. Embryos were placed in a mixture of the respective pesticide and 5 μM RB, a mixture of CYC and 5 μM RB (positive control), a mixture of DMSO and 5 μM RB (solvent control), or in 5 μM RB only (control). After incubation with RB, the embryos were washed three times with embryo medium and transferred to the conical 96-well microplates (one embryo per well). The fluorescence in the zebrafish embryos was measured using a Tecan M200 reader with an excitation wavelength of 530 nm and emission wavelength of 595 nm. Exposures were repeated five times (independent experiments) with 12 embryos per condition in each experiment. Additionally, after measurements in Tecan M200 reader, zebrafish embryos were transferred to flat 96-well microplates and using BioTek Cytation 5 with RFP filter the localization of RB in zebrafish embryos was observed. For the biochemical biomarker measurements 96 hpf zebrafish larvae (zebrafish embryos were incubated in embryo medium until 96 hpf and the medium was renewed every 24 h) were exposed for 1 h to diazinon and diuron (same concentrations as for the assessment of oxidative stress, i.e. 1, 2, 5 and 10 mg/L). After the exposure the larvae (40 per concentration) were anesthetized in 200 mg/L benzocaine (dissolved in water) and then washed twice in PBS. The larvae were transferred to Eppendorf tubes, the remaining PBS was removed and 480 µL 0.1 M phosphate buffer (pH 7.8) added. Tubes were immediately snap frozen in liquid nitrogen and placed in a freezer at − 80 °C until homogenization. After all replicates were collected (five independent repetitions), the samples were homogenized, centrifuged at 10,000×g for 15 min at 4 °C and the supernatants were used for biomarker measurements. The EROD activity was measured according to Schiwy et al. and adapted for kinetic measurements. For the measurement 35 μL of sample and 60 μL of 0.6 μM 7-ethoxyresorufin (in methanol) were added to a microwell plate. The plate was protected from light and shaken in the dark at 28 °C for 10 min. Afterwards, 45 μL of 3.35 mM NADPH (dissolved in EROD buffer) was added and the plate again incubated in the dark for 2 min at room temperature. The fluorescence was measured at 530 nm excitation and 590 nm emission for 30 min with readings every 30 s. All measurements were done in triplicates. The amount of proteins in each sample was determined and the specific EROD activity (pmol of resorufin produced in 1 min/mg of proteins) was calculated according to a standard curve with resorufin. The acetylcholinesterase (AChE) activity was measured using a protocol established by Ellman et al. and adapted for the measurement in a microwell plate. For the measurement 7.5 μL of sample, 180 μL of 0.1 M sodium phosphate buffer (pH 7.2), 10 μL of 1.6 mM 5,5′-dithiobis-(2-nitrobenzoic acid) DTNB (dissolved in phosphate buffer) and 10 μL of 156 mM acetylthiocholine iodide (dissolved in water) were added to the microwell plate. The increase in absorbance was recorded at 412 nm for 5 min. Measurements were performed in triplicates and the specific enzyme activity was expressed as nmol of acetylthiocholine iodide hydrolyzed in 1 min/mg of proteins (ɛ = 13.6 × 103 M−1 cm−1). The carboxylesterase (CES) activity was measured using a protocol established by Hosokawa and Satoh  and adapted for measurement in a microwell plate. For the measurement 15 μL of sample and 150 μL of 1 mM p-nitrophenyl acetate (dissolved in acetonitrile and diluted with water) were added to a microwell plate. The increase in absorbance was recorded at 405 nm for 2 min. The measurements were performed in triplicates and the specific enzyme activity was expressed as nmol of 4-nitrophenol produced per min per mg of protein (ɛ = 16.4 × 103 M−1 cm−1). The catalase (CAT) activity was measured using a protocol established by Claiborne . For the measurement 400 μL of 0.02 M hydrogen peroxide (dissolved in 0.1 M sodium phosphate buffer, pH 7.2) and 40 μL of sample were added to a cuvette, and the decrease in absorbance was recorded at 240 nm for 2 min. The measurements were performed in duplicate and the specific enzyme activity was expressed as μmol of degraded hydrogen peroxide per minute per mg of proteins (ɛ = 42.6 M−1 cm−1). The glutathione S-transferase (GST) activity was measured using a protocol established by Habig and Jakoby . For the measurement 15 μL of sample, 50 μL of 25 mM GSH and 180 μL of 1 mM 1-chloro-2,4-dinitrobenzene CDNB (dissolved in 96% ethanol and diluted in 0.1 M sodium phosphate buffer, pH 7.2) were added to a microwell plate. The increase in absorbance was recorded at 340 nm for 3 min. The measurements were performed in duplicate and the specific enzyme activity was expressed as nmol of conjugated GSH in one minute per mg of proteins (ɛ = 9.6 × 103 M−1 cm−1). The protein content was determined using the Bicinchoninic Acid Protein Assay Kit from Sigma Aldrich and expressed in mg/mL. The samples were added to a microwell plate followed by the addition of the BCA working solution. After a 30-min incubation period at 37 °C, the absorbance was measured at 562 nm and the protein concentrations were calculated based on the calibration curve constructed with BSA. For the measurement of biochemical biomarkers’ response in vitro the protocol provided by the manufacturer of the kits (Life Technologies) was followed. All solutions containing diazinon and diuron were prepared in 200 mM phosphate buffer pH 8 containing 2% DMSO and three concentrations were tested: 0.01, 0.05 and 0.1 mg/L (equaling 33, 165 and 330 nM diazinon and 43, 215 and 430 nM diuron). Concentrations were selected to be around the values of maximum residue limits (MRL) and for diazinon and diuron most MRLs are established at 0.01 and 0.05 mg/kg . 40 μL of these solutions was added to the plate in triplicate. P450 Regeneration system® 1 μL and P450 Baculosomes® 0.5 μL and 200 mM phosphate buffer pH 8 were mixed obtaining 10 μL of enzyme solution which was added to each well of the microplate. After 15-min incubation and shaking at 30 °C, 10 μL of Vivid fluorogenic substrates was added (EOMCC for CYP1A2, CYP2D6 and CYP2C19; CC for CYP2A6 and BOMCC for CYP2B6, CYP2C9 and CYP3A4). Fluorescence was measured in 1-min intervals for 60 min setting the excitation and emission wavelengths at 410 and 460 nm, respectively. For each enzyme a blank sample (without diazinon or diuron) and a solution of a strong inhibitor (α-naphtoflavone for CYP1A2; miconazole for CYP2B6, CYP2C9 and CYP2C19; quinidine for CYP2D6 and ketoconazole for CYP2A6 and CYP3A4) were also measured, all in triplicate. Same concentrations, prepared in 50 mM Tris–HCl buffer pH 8, were also exposed to acetylcholinesterase (AChE) following the protocol provided by the manufacturer of the kit (Molecular Probes). Briefly, 50 μL of sample was added to the plate in triplicate. 100 μL of 0.2 U/mL AChE and 100 μL of working solution (400 μM Amplex® Red reagent, 2 U/mL HRP, 0.2 U/mL choline oxidase and 100 μM acetylcholine) were added to each well. Fluorescence was measured at room temperature in 1-min intervals for 60 min setting the excitation and emission wavelengths at 560 and 585 nm, respectively. Blank samples without pesticides were used to establish the maximum signal, whereas a blank without enzyme was used to establish the minimum signal. where F is the fluorescence measured after 60 min in a Varioskan® Flash (Thermo Scientific, Finland). Pools of 25 embryos at 72 hpf were exposed for 48 h to pesticides and three independent replicates were conducted. Diazinon and diuron were tested in concentrations of 0.005 and 0.05 mg/L (equaling 16.5 and 165 nM diazinon and 2.15 and 215 nM diuron), which is substantially lower than the concentrations tested in the case of MXR activity. The reasoning for discrepancies in the concentrations tested is the fact that even though the exposure period was 48 h for both endpoints, different zebrafish embryo stages were used. Namely, for MXR activity 2 hpf embryos were used, and for gene expression level 72 hpf embryos were used. Since it was previously determined that the later stage had a higher sensitivity to diazinon exposure , it was decided to use lower concentrations of pesticides for assessment of gene expression. After 48 h of exposure embryos were visually examined for any morphological changes (such as irregular heart beat) and then the RNA was extracted from the pooled embryos using TRIzol® following the instructions of the manufacturer. RNA concentration and quality were determined using a BioAnalyzer 2100 (Agilent, Santa Clara, CA, USA). Reverse transcription reactions were carried out using 20 ng of total RNA using a TaqMan Reverse Transcriptase Reagents kit (Applied Biosystems, Carlsbad, CA, USA). Reaction conditions were as follows: 25 °C for 10 min, 48 °C for 30 min and 95 °C for 5 min. The corresponding cDNA was used as a template for qRT-PCR. Quantitative PCR was carried out with a LightCycler® 480 Real-Time PCR System (Roche, Mannheim, Germany). Genes cyp1c1, cyp3c4, cyp3a65 and gstp1 were evaluated with β-actin as a housekeeping gene (Table 1). Each reaction was performed in a 10-µL solution, containing 300 mM of each pair of primers, 5 µL SYBR Green PCR master mix (Roche) and 4 µL of the cDNA obtained in the previous step. Reaction conditions were as follows: 95 °C for 10 min, followed by 40 cycles of 95 °C for 15 s and 60 °C for 30 s. A final cycle at 95 °C for 1 min and 65 °C for 1 min, followed by 40 °C for 30 s was performed. The expression levels of RNAs were calculated according to Livak and Schmittgen . Gene sequences for primer design were taken from Ensembl Genome Browser 94. Primers were designed to span an exon–exon junction using the Primer Express software (Applied Biosystems), and primers were further checked with the Oligo analysis tool from Eurofins Genomics (https://www.eurofinsgenomics.eu/en/ecom/tools/oligo-analysis.aspx). Diazinon and diuron were analyzed using a high-performance liquid chromatographic system (HPLC) which consisted of an Agilent (Santa Clara, CA, USA) 1200 Series liquid chromatograph equipped with a degasser, a quaternary pump, an auto sampler, a column oven and a diode array detector coupled to an Agilent Ion trap XCT-Plus operating in positive ion mode with electrospray ionization (ESI). The following ions were monitored in MS1 mode: diazinon (m/z: 305) and diuron (m/z: 233). The separation was conducted on a Gemini C18 column (150 mm × 2 mm I.D., 5 µm) purchased from Phenomenex (Torrance, CA, USA) with a guard column filled with the same stationary phase. The column oven was set to 40 °C and the mobile phase was constituted by methanol (A) and water (B). Both phases were modified with 0.1% formic acid. The following elution conditions were applied: from 0 to 5 min a linear gradient from 20 to 80% of A, 80% of A was maintained for 5 min before returning the system to the initial conditions. Flow rate was 0.3 mL/min and 40 µL of sample was injected. Data analyses were performed using GraphPad Prism software. The data were checked for normality prior to further analysis (Shapiro–Wilk normality test). Since in the assessment of oxidative stress, MXR activity and biomarker responses some of the data were not normally distributed, nonparametric statistics was considered adequate for the statistical analysis. Therefore, the non-parametric Kruskal–Wallis one-way analysis of variance by ranks was performed followed by the post hoc Dunn’s test to determine the significant difference between the experimental groups. Because DMSO was used as a solvent (the same DMSO concentration of 0.1% was kept in all pesticide exposures and solvent control conditions), the analyses of pesticide effects were made in comparison to the DMSO solvent control condition. Since for the analysis non-parametric statistics were used, the data were presented as median ± interquartile range. In the case of the in vitro assessment of enzyme activity, ANOVA and post hoc Tukey test were used to determine statistical differences between different concentrations. Data from LC–MS analysis were subjected to Dunnett’s test to detect significant differences between different times of exposure and the control (initial values). The significance of the expression levels of RNAs was measured using the Relative Expression Software Tool (REST) of Qiagen (Hilden, Germany; http://www.REST.de.com) based on the pair wise fixed reallocation randomization test . These results were presented as mean ± standard deviation. The probability level for statistical significance was p < 0.05 throughout the study. The results of exposures (1 h) to both pesticides for fluorescent GSH detection CellTracker™ Green CMFDA are shown in Fig. 1. For easier comparison between pesticides, the figures were prepared with relative values (i.e. all values are divided by the average of the negative control group). The larvae were exposed to the concentrations of 1, 2, 5 and 10 mg/L diazinon and diuron. Zebrafish larvae exposed to diazinon showed a significant increase in relative fluorescence after exposure to 5 and 10 mg/L (Fig. 1a). After exposure to diazinon the average fluorescence of the DMSO group was 4700 and average values of groups exposed to 5 and 10 mg/L diazinon were 8000 and 9500, respectively. Diuron caused a significant increase in relative fluorescence as well after exposure to 2, 5 and 10 mg/L (Fig. 1b). After exposure to diuron the average fluorescence of the DMSO group was 4500 and average values of groups exposed to 2, 5 and 10 mg/L diuron were 7000, 6800 and 6500, respectively. A significant increase in relative fluorescence could also be detected in the positive control (tert-BHP). The highest increase in relative fluorescence, i.e. the strongest effect, was observed after exposure to the highest concentration of diazinon (10 mg/L). The results of exposures (2 h) to both pesticides for fluorescent ROS detection using fluorescence probe CM-H2DCFDA are shown in Fig. 2. For easier comparison between pesticides, the figures were prepared with relative values (i.e. all values are divided by the average of the negative control group). The larvae were exposed to the concentrations of 1, 2, 5 and 10 mg/L diazinon and diuron. Exposure of zebrafish larvae to the investigated pesticides have yielded no significant changes in fluorescence. The average fluorescence of the DMSO group was 3400 and of the exposed groups varied from 2800 to 3500. A significant increase in relative fluorescence could only be detected in the positive control (tert-BHP). The results of the MXR activity in zebrafish embryos exposed for 24 and 48 h to 1 and 2 mg/L diazinon and diuron are shown in Fig. 3. For easier comparison between pesticides, the figures were prepared with relative values (i.e. all values are divided by the average of the negative control group). MXR activity was assessed as a difference in the accumulation of the fluorescent dye RB (indicated by fluorescence intensity) with higher accumulation showing an inhibition and lower accumulation showing an induction of the MXR activity. 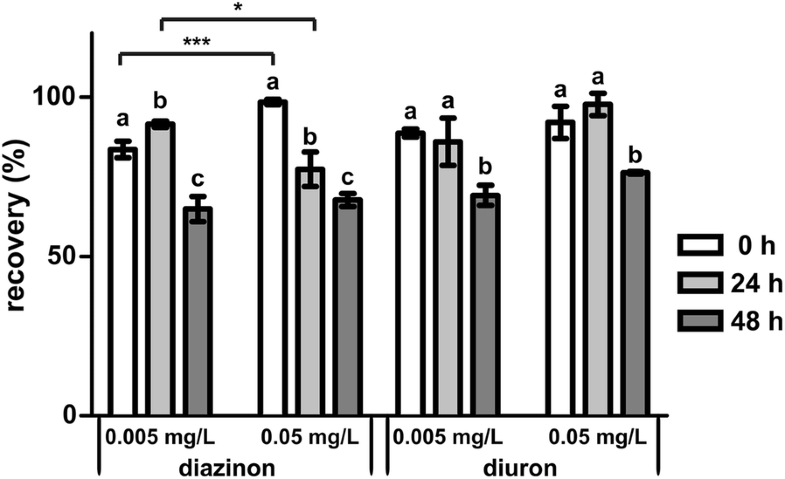 Zebrafish embryos exposed to diazinon for both 24 and 48 h showed significant increase in accumulated RB, thus demonstrating that diazinon caused an inhibition of MXR activity (Fig. 3a). After exposure to diazinon for 24 h the average fluorescence of the DMSO group was 11,000, and average values of groups exposed to 1 and 2 mg/L diazinon were 15,500 and 16,500, respectively. For the 48-h exposure, the average fluorescence of the DMSO group was 15,000, and average values of groups exposed to 1 and 2 mg/L diazinon were 18,000 and 24,000, respectively. In the case of diuron, 24 h after exposure no significant differences in RB accumulation could be detected. But after the 48-h exposure to diuron zebrafish embryos showed a significant decrease in accumulated RB demonstrating that diuron caused an induction of MXR activity (Fig. 3b). For the 48-h exposure, the average fluorescence of the DMSO group was 15,000, and average values of groups exposed to 1 and 2 mg/L diuron were 13,000 and 12,000, respectively. A significant increase in accumulated RB could also be detected for the positive control (CYC) after both exposure periods. Additionally, after the quantitative measurement of fluorescence in zebrafish embryos, they were observed using a BioTek Cytation 5 with an RFP filter, to determine the localization of accumulated RB. Figure 4 shows that accumulated RB is entirely localized in the yolk sac. The short exposure (1 h) yielded significant increase in GSH, so in order to determine if pesticides also cause changes at biochemical level zebrafish larvae (96 hpf) were exposed for 1 h to 1, 2, 5 and 10 mg/L diazinon and diuron. The measured enzymatic biomarker responses are shown in Fig. 5. After exposure to diazinon for 1 h significant differences could be detected for CES and AChE activities, where significant inhibition was observed. Namely, at all applied concentrations diazinon inhibited CES activity, with the highest inhibition of 61% measured at the highest concentration applied (10 mg/L). In the case of AChE activity, diazinon caused a significant inhibition of 45% at the two highest concentrations applied (5 and 10 mg/L). Other enzymatic biomarkers showed no significant changes after exposure to diazinon. Also, no significant changes could be detected for any of the measured enzymatic biomarkers after exposure to diuron. The inhibition of AChE activity and seven different enzymes from the CYP450 family was assessed in vitro after exposure to 0.01, 0.05 and 0.1 mg/L diazinon and diuron. Three enzymes from CYP450 family showed no inhibition (CYP2D6, CYP2A6, CYP2C9) so the data are not shown. Inhibition of the other four CYP450 enzymes and AChE were dependent on the pesticide and are shown in Fig. 6. The results showed that both pesticides caused inhibition of CYP1A2 activity with slight inhibition observed after diazinon exposure and stronger inhibition after diuron exposure. The activity of CYP2B6 and CYP3A4 was strongly affected by the presence of diazinon, whereas diuron had basically no effect on these enzymes. The highest concentration of both pesticides caused strong inhibition of CYP2C19. In the case of AChE, diazinon had no effect, whereas diuron caused inhibition of AChE activity. Contrary to that, the results obtained in zebrafish larvae (96 hpf) exposed to diazinon and diuron for 1 h showed inhibition of AChE activity after diazinon exposure and no effect on AChE activity after diuron exposure (Fig. 5). Changes in the gene expression level have been assessed after exposure of zebrafish embryos (72 hpf) for 48 h to 0.005 and 0.05 mg/L diazinon and diuron and results are shown in Fig. 7. Exposure to diazinon caused the downregulation of genes cyp3c4 and cyp3a65; however, only at the lower concentration tested (0.005 mg/L). At both concentrations it caused the slight induction of the gene gstp1. Exposure to diuron caused a slight induction of gene cyp3c4 at the higher concentration tested (0.05 mg/L). For the other genes, no effect of diuron was detected. The downregulation of cyp3c4 after diazinon exposure is in agreement with the inhibition of CYP3A4 activity observed in vitro (Fig. 6). Zebrafish embryos of 72 hpf were exposed to two concentrations of diazinon and diuron during 48 h for the assessment of the gene expression changes. The concentrations of diazinon and diuron were monitored in the exposure solutions at 0 h, 24 h and 48 h. In both cases a small decrease of their concentration was observed at 48 h and it was not dependent on the initial concentration of exposure (Fig. 8). Only at 48 h metabolites of diazinon [diazoxon and 2-isopropyl-4-methyl-6-hydroxypyrimidine (IMHP)] and diuron [1-(3,4-dichlorophenyl)-3-methylurea (DCPMU)] were detected. These metabolites are the result of oxidation and demethylation processes commonly assigned to cytochrome P450 enzymes. In the present study the occurrence of oxidative stress-related responses, MXR activity, activities of several enzymatic biomarkers in vivo and in vitro and changes in toxicant responsive genes after exposure to the pesticides diazinon and diuron were assessed (an overview of measured endpoints and obtained responses can be found in Table 2). Assessment of these parameters enabled gaining insight into the pesticide effects at different biological levels—from the changes at molecular and biochemical level to the changes in the cellular detoxification mechanism. The fluorescent detection of GSH and ROS was conducted using multiwell plates (one larva per well) by applying a recently established protocol  which provided the possibility for quantitative measurement of oxidative stress induction in whole zebrafish larvae exposed to the investigated pesticides. This protocol for fluorescent detection in whole zebrafish larvae has also been proven to be highly adaptable, as it was determined that the MXR activity could be also measured in whole zebrafish embryos avoiding the need for homogenization and reducing the number of organisms necessary for the assessment. Measurement of responses on both biochemical and molecular level provided valuable insight into the effects of the investigated pesticides and confirmed that besides the main mode of actions, these pesticides can affect non-target organisms in multiple ways and at different levels. The occurrence of oxidative stress after exposure to diazinon and diuron was assessed using fluorescent probes to detect GSH and ROS. The fluorescence probe Celltracker™ Green CMFDA was used for the detection of GSH and it proved to be sensitive for the detection of early effects of pesticides. Namely, only after 1 h of exposure a significant increase in GSH was detected for both investigated pesticides and after exposure to the highest concentration of diazinon the increase was substantially higher than the increase observed in the positive control. Due to its role as one of the major antioxidants and main antagonists of ROS molecules, the results obtained with Celltracker™ Green CMFDA for GSH detection indicate the potential induction of oxidative stress in zebrafish larvae exposed to diazinon and diuron. This is in accordance with findings from Altuntas et al. who observed induction of lipid peroxidation and changes in the activities of antioxidant enzymes in vitro after diazinon exposure, suggesting the involvement of oxidative stress in the unspecific toxic effects of diazinon on non-target organisms. On the other hand, Isik and Celik  observed fluctuating GSH levels in different tissues of rainbow trout Oncorhynchus mykiss after diazinon exposure. Regarding diuron, similar results were obtained by Felício et al. who proved that diuron triggered oxidative stress in the gills of Oreochromis niloticus. For the detection of ROS the fluorescent probe CM-H2DCFDA was used; however, no significant changes could be observed. The results indicate that either the investigated pesticides do not substantially induce ROS, or this probe may not be sensitive enough to detect changes in the production of ROS molecules after diazinon and diuron exposure. However, as increases in GSH levels were observed for both pesticides, another explanation could also be that the ROS molecules were already scavenged by the elevated antioxidative defense system of zebrafish, since the increased GSH levels indicate the occurrence of oxidative stress. Assessing the MXR activity is an important tool to get a more detailed insight into the defense mechanisms of cells as these can be highly effective in protecting organisms from potential harm due to a high xenobiotic exposure . Fischer et al. showed that Abcb4 is the main ABC transporter responsible for MXR in zebrafish. In the present study an adjusted protocol using whole zebrafish embryos for assessment was applied in order to evaluate the effects of diazinon and diuron on MXR activity. Additionally, the zebrafish embryos with the accumulated RB were microscopically inspected, and it was determined that the accumulated RB is entirely localized in the yolk sac. Both pesticides affected the MXR activity; however, different trends were observed. Diazinon caused a significant inhibition of MXR activity both after 24- and 48-h exposure, whereas diuron did not cause any changes in MXR activity after 24-h exposure, but after 48 h it caused an induction of MXR activity. Obviously, the mechanisms of action of the investigated pesticides on MXR activity are different, with diazinon causing immediate inhibition and diuron needing more time to cause effects but then inducing the MXR activity. The inhibition of MXR observed after diazinon exposure can compromise the effectiveness of the defense system, since diazinon that would normally be pumped out will remain longer in the cells and can exert its toxic effect for longer [23, 28, 36, 49]. Smital et al. observed an inhibition of MXR activity in Cyprinus carpio after diazinon exposure which is in accordance with our results. However, Felício et al. determined that diuron decreased MXR activity in Oreochromis niloticus showing that the effect of diuron on MXR activity is also species dependent. Considering the obtained results, MXR activity assessment should be included in the investigation of pesticide toxicity on aquatic organisms. In addition to the fluorescent detection of oxidative stress after short exposure to diazinon and diuron, the early effects of these pesticides were assessed also by measurement of several enzymatic biomarkers, namely the activities of EROD and CES (phase I detoxification enzymes), GST (phase II detoxification enzyme and oxidative stress biomarker), CAT (oxidative stress biomarker) and AChE (biomarker of exposure to organophosphates). The oxidative stress-related biomarkers, i.e. CAT and GST, did not yield any significant results, indicating that for the investigated pesticides the fluorescence-based assay seems to be more sensitive in detecting oxidative stress-related responses. It is also possible that the GSH reaction (increase in GSH detected by fluorescent dye) is earlier compared to the enzymatic biomarker response. Namely, studies have suggested that GST, for example, is not a highly sensitive biomarker regarding organophosphate exposures and can often only be used as a biomarker for long-exposure scenarios, as it seems to need a longer exposure period to be inhibited by organophosphates [50–52]. So the absence of an effect on enzymatic biomarkers could be due to a short exposure time. Regarding the CES and AChE activities, a significant inhibition was detected after exposure to diazinon. This result was expected since diazinon is an organophosphate and it is known that organophosphorus compounds cause the inhibition of both AChE and CES activity (reviewed in ). Although most commonly AChE is screened as a biomarker to organophosphate exposure (e.g., [54, 55]), several studies have shown that CES can be a more sensitive indicator to organophosphates than AChE (e.g., [56, 57]). In a previous study assessing diazinon effects on zebrafish, a higher sensitivity of CES was demonstrated and it was concluded that later stages of zebrafish have higher sensitivity to diazinon exposure . Higher sensitivity of CES compared to AChE was also confirmed after short exposure in the present study, since CES was inhibited at all diazinon concentrations applied (AChE only at the two highest concentrations) and the inhibition was stronger compared to AChE. In addition, Keizer et al. suggested that although AChE might be a useful biomarker, there are rather high enzymological differences of AChE between different fish species and among the fish species tested, zebrafish AChE was the most insensitive after exposure to diazinon. Therefore, in future assessments of pesticide effects, a combination measuring both AChE and CES should be applied and the selection of fish species should be taken into account. No significant changes in AChE and CES activities after diuron exposure and no response in EROD activity after exposure to both pesticides indicate that some enzymatic biomarkers were not adequate for detection of early effects of the investigated pesticides. Enzymatic activity was tested in vitro using human CYP450 and AChE enzymes to determine the effect of diazinon and diuron. Several human cytochrome P450 (CYP) enzymes have direct orthologs in zebrafish, suggesting that zebrafish xenobiotic metabolic profiles may be similar to those in mammals . As a matter of fact zebrafish CYPs belonging to families 1–3 possess two of the three regulatory mechanisms of human CYPs, specifically the pregnane X receptor (PRX) and the carbon aryl receptor (AHR)  showing that zebrafish can be used as a close model to test the effect of xenobiotic in vertebrates. Cytochrome P450s are one of the most important groups of hemoproteins which are involved in reduction and oxidation reactions, especially in drug-metabolizing and in the metabolism of the endogenous substances . Pesticides can be metabolized by CYP450 enzymes to generate less toxic compounds, but they can also inhibit CYP450 activity increasing the amount of active substances with the capacity of causing an adverse effect since they are not metabolized [62, 63]. For the catalytic reaction to occur, affinity between the active substance compound and the CYP isoform is necessary to undergo the catalytic reaction, but also the accessibility of the compound to the active site, the orientation and the facility to react with the heme group are important . AChE shows also changes in the presence of xenobiotic substances including pesticides such as organophosphorus compounds and carbamates . The inhibition of the enzymatic activity was studied measuring the reduction of a fluorescence signal, which was produced by the metabolism of choline, the reaction product of AChE. The activity of three of the enzymes studied (CYP2A6, CYP2D6 and CYP2C9) was not affected by the presence of diuron or diazinon at the concentration levels studied. Despite this fact, these enzymes are known to be involved in the N-demethylation of diuron and in the desulfuration of diazinon [66, 67]. Diuron showed inhibition of CYP1A2 and CYP2C19; however, Abass et al. only reported inhibitory activity for CYP1A2, whereas in the case of CYP2C19 and other CYP enzymes no effect was observed. This inconsistency of the results might be due to the different enzyme activity assessed. Most of the enzymes of this family are able to catalyze a variety of reactions. In this work we determined the O-deethylase activity, whereas Abass et al. detected the omeprazole hydroxylation. The in vivo EROD assay measured in zebrafish larvae is also a O-deethylase activity associated with the activity of CYP1 enzymes in several organisms . However, EROD activity was not affected, whereas the CYP1A2 enzyme was inhibited. This discrepancy cannot be linked only to a short exposure time, as significant differences in EROD activity after similar exposure times to other xenobiotics have been reported in zebrafish . One possible reason might be the difference in CYP1 structures between zebrafish and the human CYP1 used in the in vitro study that probably affects its catalytic properties and the potential inhibition by xenobiotics . Due to the activity of CYP enzymes diuron undergoes N-demethylation, and the metabolite 1-(3,4-dichlorophenyl)-3-methylurea was detected in the exposure media while the concentration of diuron decreased. Diazinon showed a different inhibition pattern and it was able to somehow decrease the activity of CYP2C19, CYP2B6 and CYP3A4 as other organophosphorous compounds do . In the case of CYP1A2 the inhibition was very weak (< 20%) and not concentration dependent, which correlates well with the result of EROD activity. Regarding AChE, in the presence of these substances, diuron showed inhibition but diazinon did not. Consequently, these results are not in accordance with the results obtained in vivo. Diazinon did not present inhibition because the inhibitor compound is the oxon metabolite . The previous oxidation of diazinon to diazoxon is necessary to cause the inhibition [58, 72], and the in vitro assay does not include such an oxidation process prior to the enzymatic reaction. The in vivo assay, on the other hand, showed a significant effect on AChE activity in zebrafish larvae, because diazinon is previously oxidized by its metabolism by CYP enzymes. Indeed, the concentration of diazinon in the exposure media was significantly reduced after 48 h, and diazoxon and IMHP were detected. Diuron was also able to inhibit the activity of AChE, as reported by Ahmed et al. , in contrast to the results in zebrafish. Diuron might follow another pathway (e.g., metabolisation) before affecting the AChE and probably needs a longer exposure time. El-Nahhal and Lubbad  observed inhibition of AChE activity in chicken after administration of diuron for longer periods. The effects of diazinon and diuron were also tested at molecular level. A few genes were selected based on their response to toxicants and on their homology to humans. Specifically, gene cyp1c1 was selected because in spite of not having a counterpart in humans , it is involved in the metabolization of a very wide spectrum of substances that are metabolized in humans by CYP1, CYP2 and CYP3 . 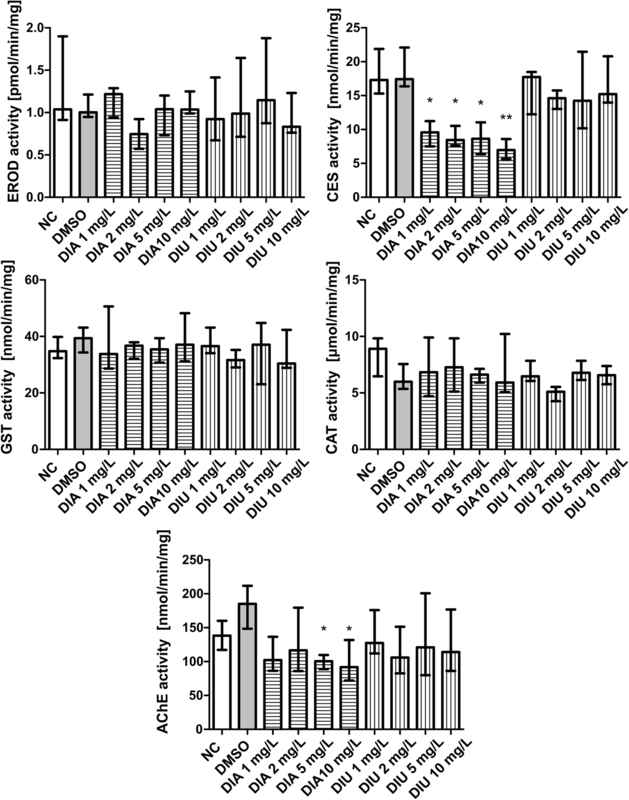 Genes cyp3c4 and cyp3a65 share synteny with human CYP3A4 [70, 76]. Gstp1 encodes for its correspondent phase II detoxification enzyme that plays an important role in detoxification in fish and humans. Diazinon caused the downregulation of gene cyp3c4 at the lowest concentration tested and this result is in agreement with the results obtained in the inhibition detected in vitro for the corresponding human CYP3A4 enzyme. Additionally, it caused the downregulation of cyp3a65. At the highest concentrations tested both diazinon and diuron caused the induction of gstp1. The induction caused by diazinon confirmed the results obtained by Velki et al. even though in that case higher concentrations of pesticides were applied. The results obtained in the present study demonstrated various impacts of the investigated pesticides, diazinon and diuron, on different zebrafish embryo stages. Assessment of early effects of pesticides showed significant effects leading to increased GSH levels and alterations in the responses of some enzyme activities (inhibition of CES and AChE activity after diazinon exposure). The recently established protocol for fluorescent detection in whole zebrafish larvae proved to be applicable for assessment of pesticide effects (detected increase in GSH levels after short exposure) and demonstrated that the fluorescence-based assay could be sensitive for the detection of early effects of pesticides. Additionally, it showed to be adaptable to other protocols, as the MXR activity was measured using the whole zebrafish embryos, and significant changes in the MXR activity were observed after exposure to both pesticides. Changes in MXR activity are of great importance in predicting the toxicity of pesticides since the inhibition of MXR activity can lead to the increase in toxicity. Obtained results and application of the adapted protocol open up the possibility of future research into the influence of MXR activation/inhibition on the toxicity of pesticides, in single substance testing as well as co-exposure of several pesticides. In vivo and in vitro assessed enzymatic activities, together with gene expression changes, confirmed the complex responses of zebrafish to pesticide exposure. For the in-depth investigation and proper understanding of pesticide effects it is necessary to assess a range of different endpoints, and, therefore, a battery of assays that will involve different mechanisms is recommended. The recently developed and adapted fluorescence-based assays, which are in accordance with the 3R principle due to the reduction of required organisms, proved to be helpful tools to further investigate the effects of pesticides and prediction of their toxicity. These protocols will be further expanded to a multi-endpoint bioassay and improved towards parallel measurement of a set of different signals. MV and CL performed and analyzed results of quantitative GSH and ROS detection, MXR activity and enzymatic biomarker responses, and drafted the manuscript. AB, AEA and SR performed and analyzed results of in vitro enzymatic activities, gene expression measurements and concentrations of diazinon and diuron. TBS supervised the study. TBS and HH contributed to the interpretation of the results and to the writing of the manuscript. All authors read and approved the final manuscript. The authors would like to kindly thank the Tecan Group Ltd. for their contribution to this study as a partner of the Students Lab “Fascinating Environment” at Aachen Biology and Biotechnology (ABBt). The datasets obtained and analyzed in the current study are available from the corresponding author on reasonable request. The use of zebrafish was in accordance with the animal welfare act. All experiments were terminated at 120 hpf and since zebrafish embryos and larvae below 120 h post fertilization are not considered animals, no animal test authorization is required according to European legislation (EU Directive, 2010/63/EU); Real Decreto 53/2013 in Spain and TierSchG (Tierschutzgesetz) and the respective regulation TierSchVersV (Tierschutz-Versuchstierverordnung) in Germany. The research stay of Mirna Velki at Department of Ecosystem Analysis, Institute for Environmental Research, RWTH Aachen University was supported by Alexander von Humboldt Foundation (Research Fellowship for postdoctoral researchers). This research was partly funded by the Agriculture and Fisheries Department of the Basque Government (project NEWKIT), by the European Union H2020 research and innovation programme under the EU-China-Safe project (Grant Agreement No. 727864) and by the Spanish Ministry of Economy and Competitiveness (Grant No. CTQ2017-83569-C2-2-R). Amaia Ereño Artabe wishes to thank the Basque Government for a PhD grant (fellowship for research personnel in the scientific-technological and business environment of the Basque agro-fisheries and food sector of the Department of Economic Development and Infrastructure).